FAST. Air freight services are vital when your goods must be delivered over longer distances quickly. It’s the best and fastest transit compared to any type of surface transportation. QUICK INVENTORY TURNS. For higher valued goods, air freight enables a supply chain with fast and consistent deliveries to convert your high value inventory into dollars through faster inventory turns. An example: apparel for retail stores cannot be sold if it’s not on the shelf. SAVES MONEY. When your production line or machine breaks down, although the replacement part may not be expensive, it could be a vital component to getting your production back up and running. Using air freight transport saves you money in many cases where productivity and getting product to the market are critical to your bottom line. Using air freight is the expedited tool that makes this happen. VALUE PRICED. Even when shipping low value goods or materials that are not needed for immediate replacement, you need an effective way to deliver goods faster than ocean carriage but without the high price of expedited airfreight. DGX - Dependable Global Express offers an advantage with our consolidation air service that benefits you by customizing delivery at a cost somewhere between next-flight-out air freight and slower ocean service. FLEXIBILITY. You have flexibility in flight schedules compared to ocean sailing schedules, resulting in faster and more dependable routes available through a large network of origin and destination airports. INSURANCE SAVINGS. You save on cargo insurance premiums because air freight shipments have a short transit time and extremely high level of security, reducing risks to insurance underwriters, and lowering costs. LOWER STORAGE COST. Warehousing is less expensive for you because we offer just-in-time air freight deliveries that reduces warehousing space to keep items in stock. FAST CUSTOMS CLEARANCE. 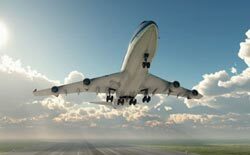 Your international air shipments are generally cleared by Customs within a matter of hours which in turn helps air cargo operators and ground handlers to be much more efficient with your cargo. Feel free to contact us today to get an air cargo rate!